Benjamin S. "Ben" Carson, Sr (born September 18, 1951) is an American neurosurgeon and politician. 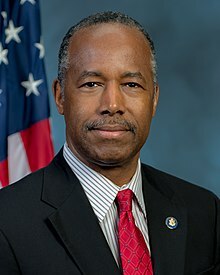 He is the 17th and current United States Secretary of Housing and Urban Development. After graduating from Yale University, Carson went to University of Michigan Medical School, and was later accepted to Johns Hopkins University. In 2008, Carson was awarded the Presidential Medal of Freedom from George W. Bush. He was the Director of Pediatric Neurosurgery at Johns Hopkins Hospital. He is known for, among other accomplishments, being the first doctor to separate twins that were joined together at the head. Carson was born in Detroit, Michigan to Sonya Copeland and to Robert Carson. He studied at Yale University and at the University of Michigan. Carson was a professor of neurosurgery, oncology, plastic surgery, and pediatrics, and he was the director of pediatric neurosurgery at Johns Hopkins Hospital. At 33, he became the youngest major division director in the hospital's history as director of pediatric neurosurgery. He was also a co-director of the Johns Hopkins Craniofacial Center. He was the first surgeon to successfully separate conjoined twins joined at the head. In 2008 he was awarded the Presidential Medal of Freedom by President George W. Bush. After delivering a widely publicized speech at the 2013 National Prayer Breakfast, he became a popular conservative figure in political media for his views on social and political issues. In March 2013, Carson announced he would retire as a surgeon, stating "I'd much rather quit when I'm at the top of my game". His retirement became official on July 1, 2013. Carson ran for the Republican nomination for President of the United States in the 2016 election. On March 2 following the 2016 Super Tuesday primaries, Carson announced that while he was not suspending his campaign he "did not see a 'path forward'" and would not attend the next Republican debate in Detroit. On March 4, 2016, Carson suspended his presidential campaign. He later endorsed Donald Trump. On December 5, 2016, Donald Trump nominated Carson for the job of United States Secretary of Housing and Urban Development. On March 2, 2017, Carson was confirmed by the United States Senate in a 58–41 vote. Carson married Candy Carson in 1975. They have three children. He is a member of the Seventh-day Adventist Church. ↑ Solomon, John. Ben Carson officially changes political parties, rejoins GOP, The Washington Times (November 4, 2014). ↑ Flores, Reena (June 4, 2015). "How much are Carly Fiorina and Ben Carson worth?". CBS News. Retrieved May 4, 2016. ↑ "Neurologists & Neurosurgeons at Johns Hopkins he also worked at K.H.M.H in Belize in 2009 where he did twelve operations. – Profile: Dr. Benjamin Carson". Hopkins Medicine. June 24, 2013. Retrieved May 20, 2013. ↑ Preston, Mark (December 3, 2014). "Ben Carson: Political phenomenon". CNN. Retrieved May 9, 2015. ↑ Blake, Aaron (March 16, 2013). "Ben Carson announces retirement, feeds presidential speculation". Washington Post. Retrieved June 24, 2013. ↑ Williams, Armstrong (1 July 2013). "My Chat With Retiring Dr. Ben Carson". Newsmax. Retrieved July 1, 2013. ↑ Peoples, Steve; Barrow, Bill (May 3, 2015). "Ben Carson, famed neurosurgeon, running for president". Yahoo! news. Retrieved May 9, 2015. ↑ Robert Costa; Ben Terris (2 March 2016). "Ben Carson tells supporters he sees no 'path forward' for presidential campaign". The Washington Post. ↑ "Ben Carson Suspends 2016 Presidential Campaign at CPAC". NBC News.com. Retrieved March 4, 2016. ↑ "CSPAN on Twitter". Twitter. Retrieved 2017-03-02. This page was last changed on 22 April 2019, at 13:56.